This PDF 1.3 document has been generated by Word / Mac OS X 10.11.6 Quartz PDFContext, and has been sent on pdf-archive.com on 20/03/2017 at 07:45, from IP address 41.74.x.x. The current document download page has been viewed 301 times. File size: 1.5 MB (21 pages). - Where can I adopt a bunny? away completely to encourage hay eating ‒ your bunnies WILL beg for it, don t give in! 1-2 tbsp. quality, non muesli pellets, tsp. of occasional fruit/treats. could get Gastrointestinal (GI) stasis where the digestive system completely shuts down. why hay should be available at all times. genital area, you might need to have him shaved by a vet (under sedation). people realising that they cannot afford their pets. vet (R650 ‒ R1200), Dental or general surgery (R650 +). properly, and it is advised to always let kids sit on the floor and interact with them. a cat). What we can confirm though, is that it s totally worth the patience and effort. on grooming, please ask our group members or check out our DIY videos on YouTube. chance at a successful bond. occurred. They also have different dietary needs. 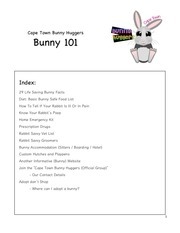 playpens or enclosed runs, or bunny proof an area of your house. because then he definitely isn t bun-savvy. him/her shaved for the summer at a rabbit-savvy parlour. 🐇 A rabbit's digestive system is more similar to a horse s than any other animal. (Explains the hay!) This is also why they need specialized vet care. good behaviour. You can substitute by feeding more greens. comprehensive list of safe plants, trees and flowers. 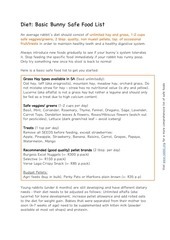 varieties of better (more nutrient) alternatives. poop after illness or surgery. Your bun s poop is the best way to monitor his health. everywhere, and caecotrophes (grapelike, squishy poo that they eat from their bum). often mistaken for diarrhea. Real diarrhea is very rare in rabbits, but can be fatal. 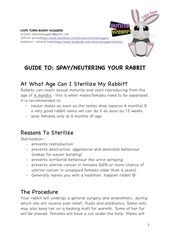 groom your rabbit more frequently to prevent excess hair from being digested. NO POOP = VET EMERGENCY! over the place - best to get them sterilized, it helps with the manners. animal deserves to be left in a box in the wild. has already progressed and it is time to see a vet immediately - DO NOT WASTE TIME. weekends or late evenings when all the vets are closed. This file has been shared by a user of PDF Archive. Document ID: 00571284.